Stuart is making a daytime comeback, with a GH debut scheduled for July 8. He tells Soap Opera Digest his new role as “so fun, it just seemed like it would be exactly the way that I would want to go back. I wouldn’t want to go back to anything subtle!” He previously played Will Cortlandt on All My Children. Wilson reveals to Soap Opera Digest how she found in February out about her upcoming exit. “Albert Alarr [co-executive producer] gave me a call and he told me about the change of direction for the character,” she recounts. Wilson last airs as Summer Townsend later this month. Connie Britton (Rayna James) and Hayden Panettiere (Juliette Barnes) are both poised to return to the CMT-bound Nashville in Season 5, TVLine is reporting. 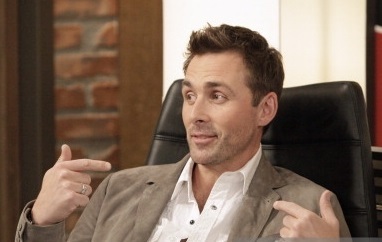 Also expected back for the 22-episode season are co-stars Charles Esten (Deacon Claybourne), Sam Palladio (Gunnar Scott), Jonathan Jackson (Avery Barkley), Clare Bowen (Scarlett O'Conno), Lennon Stella (Maddie Conrad), Maisy Stella (Daphene Conrad) and Chris Carmack (Will Lexington). A report in The Sun suggested that cast members were unhappy with the extra-hectic schedules set to begin in late 2017, and feared that the additional episode per week will adversely affect the quality of writing on the soap’s storylines. But showrunners have since revealed that cast members are actually behind the move, describing the reaction from cast favorites as overwhelmingly positive." A Corrie spokesperson told Digital Spy: "We’ve had an overwhelmingly positive response to the news from cast, writers and crew when it was shared with them and the production team on Wednesday." Said Hansis (ATWT's Luke Snyder): "I think it’s really important to stay out there and keep fighting and to not let something like this terrible tragedy stop the celebration and the ownership of how far we’ve all come. It’s very telling that even though gay marriage passed across the country and things have changed so much for the positive, there’s still this underlying homophobia. You’ve got to stay angry, and you’ve got to stay vigilant. You have to ask for more than just moments of silence and prayers at times like this."